Check-in at Berlin Tegel was uncomplicated as usual. After the already succeeded Online Check-in without printed boarding ticket (done in the hotel), baggage check-in went fast. The luggage disappeared behind the counter and immediately an advice for Lufthansa’s own lounge followed. The ladies at Check-in and inside the lounge were distinctly pleasant – quite congenial. After having coffee and reading the paper I went to boarding at Gate A10, where the aircraft to Munich would take off. Super friendly security personnel here, too. And no queue at all. That’s were the famous joke of Berlin security comes from:” You are lucky: there is no traffic jam on the A10 (name of a highway in Germany)”. Flight LH 2035 was on time, so that it went straight to Munich. On the flight I had seat 1D and even got acquainted with Günter Verheugen, the EU politician. The flight itself, with duration of one hour, is not noteworthy at all. 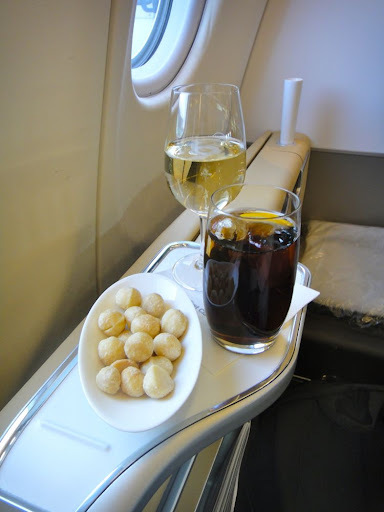 Service and snacks were good and I appreciate Lufthansa’s Europa cabin once more. Landing at bright sunshine, I was the first one to leave the plane, which is not special when sitting in first row. A nice farewell is followed by the advice to visit LH First Class Lounge (report follows) that had to be seen. I followed the advice, which I planned anyways. First Class Lounge by Lufthansa in MUC (jump straight to the post First C. Lounge MUC). When entering the lounge, I was immediately welcomed by a sincere and friendly reception, passport receipt and the suggestion: “Let me take this for you”, coming with a charming smile. The upward stairs (you can take the elevator if you like) lead straight to the detached counter of the Bundespolizei that dispatches guests right before lounge. More about the lounge in this post, just let me say that: it is subdivided into several areas. One of them is for food, similar to a restaurant, one lounge are, a little SPA and a cigar lounge. All together you find very friendly and attentive service here. Shortly before boarding I left the lounge with the advice to “leave my time, we’ll start boarding in about 10 minutes.” After another boarding ticket check, for which there is an extra First Class counter beneath Business and Economy Class, came a short security check. Either I was lucky or they are always that friendly. The mister controlling the luggage device patiently explained to me what he saw on the screen, why laptop and iPad should not be one above the other and wished me a nice flight. Just at the gate the announcement to board took place. I was second passenger on board and 1. in First Class, since there is a separated way aside for Business Class. It was not so tough though: just three of the possible 8 seats were booked. After storing my jacket I was welcomed by Purser and captain, who told be something about the flight and how much they were looking forward having the new First Class on board. 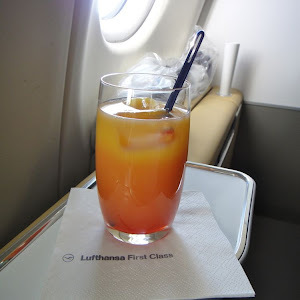 After my taste, the new First Class of Lufthansa is a quite high-class and nice product. The walls of the plane are covered with some kind of mellow covering. They don’t give you the cold airplane feeling at all, but rather of “home”. Bright leather of guise and dark seats fit well together and convey a premium feeling. After being greeted by name and relieved of my luggage I got a few utensils. Pajama suits the seats, which is about grey pants and blue top, both being from van Laak and feeling great. You get slippers, as well in grey, and two cloth bags for your own shoes, which can be stored right in the ottoman. There you also find extra storage room like in a box. So there is also a net for newspaper, sundries or whatever else. The amenity kit comes in a nice Porsche design; equipped with sleep mask, socks, tooth brush and crème, hairbrush and earplugs. The items are of high quality and can be used multiple times, which is why they are brought in a small plastic box. The kit is used by many as a little “cleaning bag” for short travel or pencil case, as I was told by stewardess (who was amazed by the Porsche design). 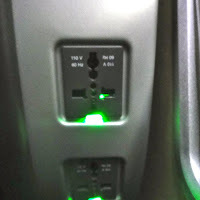 Two storage compartments providing power points with two bus bars, one Ethernet and one USB port, are located on the left respectively on the right of the seat. They contain European and American plugs and can be used without adapter. 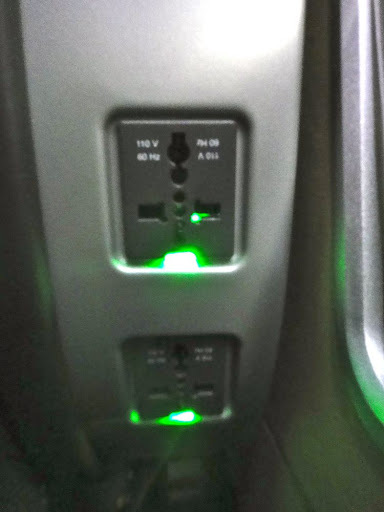 In the first compartment you would find a port for the earplugs. Lufthansa offers First Class guests very valuable “over the ear” headphones by BOSE. These don’t only provide a relaxed listening experience, but they also shield from outer noises. Window seat offer four windows and therefore provide “enough” perspective to watch the beautiful sunset. The seat itself comes with multiple configurations. Control is not done via touch screen, other than Swiss, but via background-illuminated switches, which are located underneath a hatch. The most important switches to change the seat into a bed, adjust arm- or headrest and position for take off and landing are located right above and can be used without having to open the hatch. The seat itself is big and cozy. You can transform it into a comfortable bed at any time. Since we are only three today and eight seats are available the Purser offered me to prepare bed on another seat, so that I could switch between eating, sleeping and working, which would be more comfortable for me. Quite attentive; such as the whole service on the flight. The table, other than at Swiss, is not so big, but it has a crucial advantage. It can be shifted forwards in order to get up easily and keep the table set at the same time. This is not possible at Swiss; because you just cant get up. The height of the head section can be adjusted so that it offers the possibility to sit in a relaxed way, also for tall people. Corridor sideways you are protected by a movable cover. If you do so, you can provide yourself a little more privacy. There is also enough lighting. There is a kind of “indirect” light beneath the screen on the left side and on the little tablet, which is ideal for watching TV. For diner, you use one of the two table lamps above the seat. Sadly, that there is no function for dimming, which leaves you with on or off. Not too much of a big problem that occurred to me when I compared to Swiss Air. If you do not want to sit anymore, you can simply lie down. The stewardess gladly prepares the bed for you. First, a cushion is put on the flat and more than two meters long seat. Bedding as well as pillow is very, very high-quality and comfortable. As I wrote in my post about Swiss Air or British Airways, a good bedding is quite important for healthy sleeping. The sheet is “nicely warm”, doesn’t make you sweat and provides a restful sleep to me. Even “sleeping on your stomach”, which is hardly possible in most airplanes, works pretty well thanks to the broad seat. So there is no factor speaking against restfully sleeping on this flight. Other than on my last First Class flight with Lufthansa to SFO and SEA in May last year, Lufthansa now offers a bed for day flights. That’s very comfortable, especially when travelers want to work at the destination or familiarize with the daily rhythm. But also everybody else, who “just” wants to stretch out on the normal seats, enjoys the high-class and cuddly blanket. A well done product so to say. 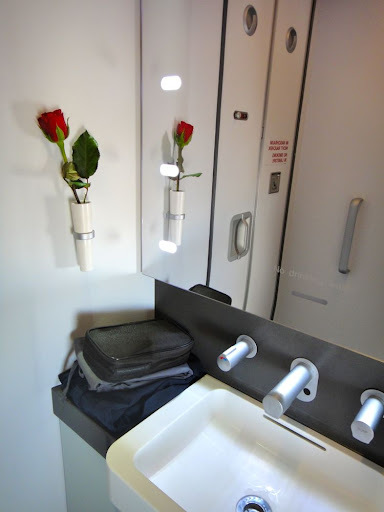 Even the toilet, which is normally rather small and uncomfortable, is designed in relation to First Class, appears more customer friendly and give you more room to move, even though it’s a little complicated to take a picture of. The screen is not as big as in First Class of Swiss Air, but for my needs more than sufficient. I recently read in a forum a post of a user that thought the size of the screen was way too small, but I don’t think so. Even when you’re lying in bed it’s not a problem at all, even playing games. The system offers besides a whole series of movies, sorted in columns Action, Drama, Comedy and lots more, a variety of interesting ways to keep you busy. The movies are up to date and include current cinema movies. Today it was “Puss in Boots”. So everybody can do whatever he likes: watch news or TV, play or “learn something”. This part provides audio books about topics like economy, besides language courses. Therewith you can learn a few about vocabulary or the way of business mails before landing. Also the small ones are taken care of. There is an own column “JetFriends” including games, audio books and movies just for kids. Of course, also an air show is included in the entertainment system. Nothing special, but you get an informational map or actual flight information on request. Unfortunately there is no outer camera. These months stand under the motto of the “Lufthansa Star Chef Program” with the celebrity chefs “Thomas and Mathias Sühring”. Who wants to know more about recipes and dishes, can find everything on http://www.lufthansa.com/starchefs. The two “chef twins” provide gourmet kitchen in their restaurant Mezzaluna in Bangkok, which can now be enjoyed in the “restaurant above clouds”. First, there is a quite tasty “greeting from the kitchen”. This time it was a tasty tomato jelly with goat cheese and pesto, refined with a little chili. Even if the selection of “king prawns with palm hearts”, “pomelo salad with smooth chili” or “Thai salad with quail breast” sounded very delicious, I chose caviar with traditional side dishes, but no Vodka. After the salad, which I took instead of Parigiano Reggiano cheese soup, the main course followed. Today it was rose fried duck breast, Bok Choi and cauliflower risotto, whereas the latter was not really my taste. Nevertheless the menu altogether was delicious, nicely served and an experience of taste. A very tasty dessert then rounded it up. This time I decided for “Schwarzwälder Kirsch” in a Mezzaluna interpretation 2012. It bargains for a chocolate bar, cherry brandy parfait, garnished with a drop wise served, old balsamic vinegar. Today, the menu was accompanied by Campari-Orange as aperitif. An alternative would have been Sherry “La Guita” or Camitz Sparkling Vodka. This special Vodka from Sweden is mixed with carbon dioxide and provides an extraordinary taste adventure, as I will find out later. For diner I took a glas of 2010 Keltic Terre, Pino Blanc, Menger-Krug from Germany. The menu provides four different white wines, four red ones and two for dessert. For any of these good wines you get a detailed description of cultivation and taste. Also lovers of noble spirits don’t come off badly. Besides the noble “Cognac Lheraud Cuvee 30” there are nine other sorts of Whiskey, Gin, Vodka and Brandies available. Also port wine (2005 Late Bottled Vintage Port, Niepoort” or Baileys Irish Cream are part of the selection. For everybody who wants to abandon alcohol, there is a solution. Besides six different kinds of Eilles tea, including interesting sorts like Rooibos Winterpunch, there are different hot and cold beverages. For the preparation of coffee specialties like Espresso or Cappuccino three Nespresso Grands Crus are being used. Water comes from the brand Apolinaris, fruit juices by Albi and adding up to that Coca cola or Kinleys Tonic, Ginger Ale or Bitter Lemon. Of course there is beer on board, as to be expected on a flight from Munich wheat beer, but also Warsteiner (alcoholic and non-alcoholic). Instead of the little snack short before landing, consisting of beef broth, I decided for the “cold” variant. 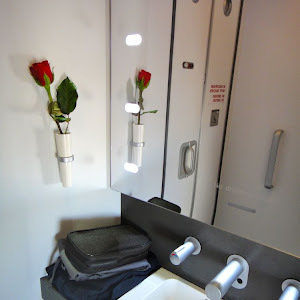 Altogether a very successful and extensive selection, which makes the flight a nice experience. After 8:35h you don’t want to leave the plane after such a nice and relaxing flight in order to get into the queue for immigration. But this time it went amazingly fast and so I was shortly after that in front of luggage retention and met the driver, who was already expecting me at the exit. Since it is 9:30 PM in New York, I headed directly to the hotel in Manhattan, since I was well rested already. 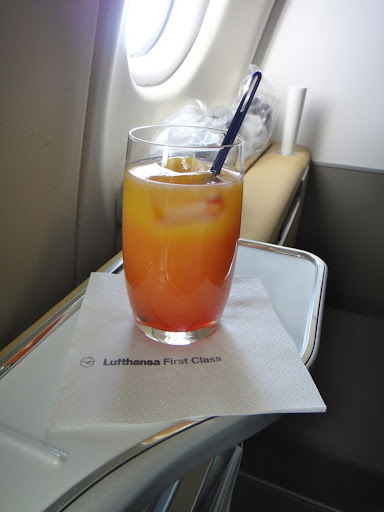 Who has the chance to try out the new Lufthansa First Class – go for it! There are a lot of posts in the “Vielfliegertreff” forum and also an overview of machines that are equipped with the new First Class. This is not only nice, but also a good experience. Here is a series of pictures in order to make the impression more realistic. 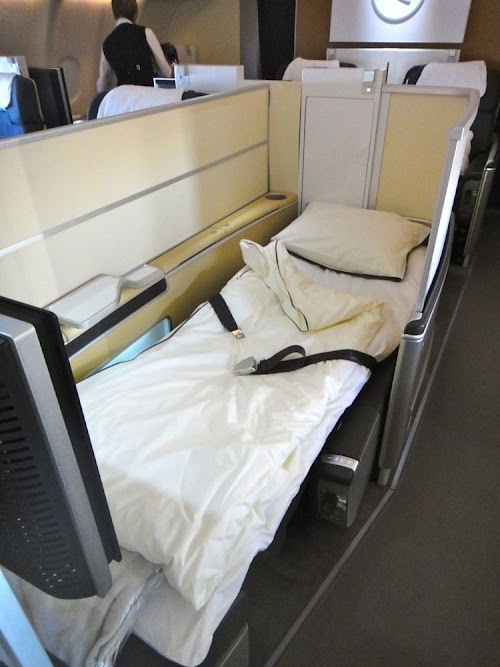 In one week I get back, maybe in the new First Class again. Then, in February, there will be another two interesting journeys. 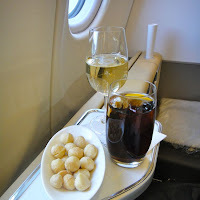 I will visit the recently opened Park Hyatt in Abu Dhabi in AirBerlin’s Business Class (not so exciting so far) , then in mid February with Qantas First Class via Singapore and Hongkong to Australia, where I will be collecting pictures and facts again.